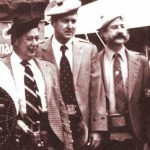 In the early 1970's, Hugh MacRae II sought permission from John MacRae in Conchra, Scotland to start a Clan MacRae Society of North America. Permission was granted, and on April 28, 1973, Hugh met with John McRae of Danville, VA and John MaCree of New York City, NY. The three decided that the Clan MacRae Society of North America would be founded with Hugh as President and the other two as Vice-Presidents.